Checking in with some random thoughts. The blogs are still frequently on my mind, I’m just busy during the day, and by evening I am too exhausted to write. I will also admit, a bit guiltily, that I am really enjoying my life without going on the computer every day. I check email and peruse blogs and social media through my phone now. But I rarely sit in a chair for hours anymore. It’s just part of the changes of life. We’re also scurrying around the house, preparing for winter. We painted what could be painted (outside) and finished my enormous bookshelf project (see NewYorkRenovator for photo). We also *finally* installed drywall and painted a small pantry closet in the kitchen. I gutted that in 2011 and never finished it. It’s great being able to organize my kitchen loot again. I WISH I could tell you about work. The stories I could tell! Oh, they’d have my head, they would. I will tell you a few vague things, hee hee. One is, people expect postal workers to work “magic.” That’s what I call it, anyway. Folks walk in months after their mail receptacle has been closed, asking for their mail that you were supposed to hold because they moved away to a new city, and how dare I not know where they live now, and how dare I return their mail to sender! :banghead: Or here’s a good one — some people literally foam at the mouth that I return their mail to sender TWO YEARS after they closed their receptacle. How on earth am I supposed to get it to them, drive to their new home and deliver it myself?! Weird. My daughter says I should be sassy as say, “Are you sure you don’t want to buy two stamps today? Then you won’t have to come in tomorrow!” :grinny: Oh, I’m sure that would go over well…. Anyway, that’s all I can say. Don’t tell anyone, ok? Here’s a photo of a cat. I took the photo while visiting Catskill, NY, this summer. 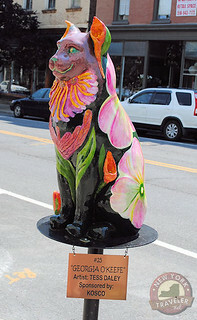 Every year, local artists create paper mache cats (dogs are in the thing, now, too) and set them up on Main Street. The street is filled with very creative works, and is fun to peruse. At the end of the summer, the creations are auctioned off to support some Catskill city venture. This cat is modeled after Georgia O’Keefe’s paintings. Pretty! And now it is time for me to sign off. I have yet to pay some bills, grocery shop, create a chore chart for the kids, and start a meal for tomorrow! So see you around!